We decided to go back up to Virginia City and Nevada City and check out the ghost towns and the Mining Museum. Since it is only about a two hour drive back up to Virginia City from West Yellostone, we took our time getting started in the morning, and on the drive up, we stopped at the landslide location where in August of 1959, a huge landslide occured in conjunction with the earthquake and the landslide stopped up the Madison River. I think there were 26 people killed. The Army Corps of Engineers went to work right away to cut a spillway in the landslide dam so that the river wouldn't back up too much. There is a nice little visitor center that describes the whole thing. In Virginia City, we first drove up to boot hill and saw where four "road agents" were burried. Then we walked around the town a bit. The old newspaper builiding is still intact with all of the equipment. It is open for viewing, that is you can walk in the door and stand behind a glass wall and view the whole thing. 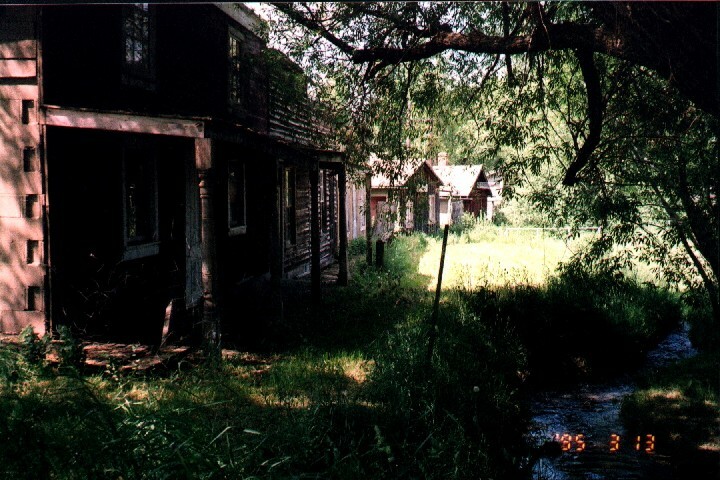 This is one of the back streets of Virginia City. It shows how the regular folks lived I think. The next stop was the free museum and gift store. They had a bunch of souvenier trinkets for sale and a lot of artifacts about local history. From pictures, to clothes, to kitchen utensils, and on and on. In the basement they had another display from the old newspaper and copies of all the newspapers for each year the newspaper was published in bound volumes. This was really interesting. They had a 1908 and 1910 volume and I puruzed those. 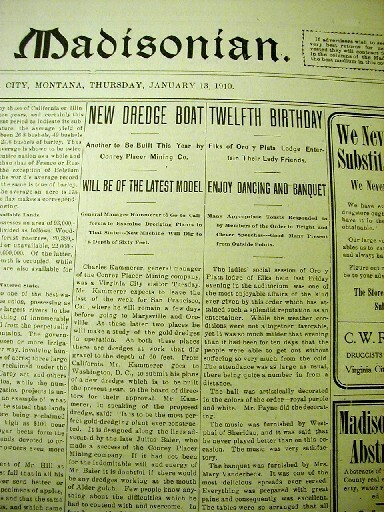 I found several articles about the Conrey Placer Mining Company and the dredges they built and used. We stood there and read article for maybe an hour, and would have liked to have spent the day reading. Connie was reading a novel that was published a little each week. I was almost stunned at this find. In Ohio, any newspaper from 1908 or 1910 would not be made available to the public in this open fashion. You would have to make a special request and an appointment (for example at the Ohio Historical Society) to be able to handle such materials. I guess its just the difference between Montana with a population less than the city of Columbus. There just aren't the number of people to come in and damage the materials, although having them just laying about in the basement of this museum is a little disconcerting. After that museum, we walked down the street to the official Virginia City Museum and Library. They had a much smaller display, but much more professionally done. I didn't see any books, other than a few for sale (and I did buy one that is a personal rememberance of the Conrey operations), so maybe they are much more protective of their holdings. The dicotemy between these two museums just a short walk down the street from each other is surprising. 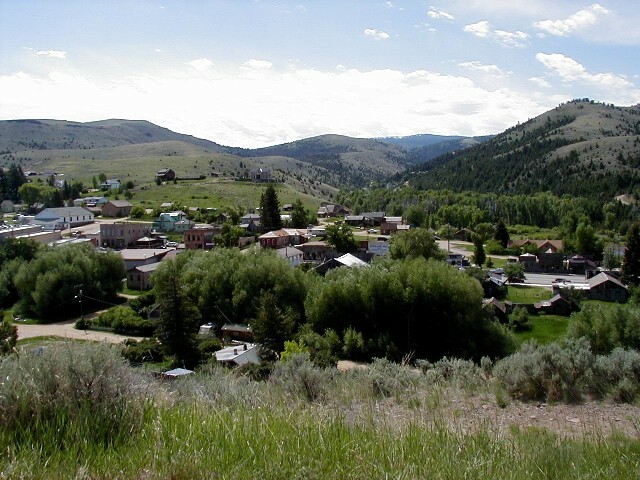 We left Virginia City and went down the road to Neveda City which is a man made ghost town. The buildings are real old buildings, but they were originally built at other places and the property and then the buildings were collected by an individual. There must be 40 buildings there. We did not pay to take the tour, but were impressed that someone would collect builidings. Its sort of like Greenfield Village of the west. The mining museum was a total bust. They just had a bunch of junk, well not really even that much, of stuff that was related to mining of all types, and very little on placer mining. I asked the keeper if he knew what happened to the dredge boats, and he didnt' know. He suggested that they brochure they had might tell - he hadn't read it himself!